In a partnership with Stephenson Service Company and Growmark, Highland Community College unveiled a spray simulator applicator on Tuesday, Oct. 16, at the college located at 2998 W. Pearl City Road in Freeport, Ill. The simulator is a partnership with Stephenson Service Company, Growmark, and the Highland Ag Program to train students to potentially become a proficient spray applicator. The simulator works students through a series of real-world scenarios from road travel to basic field operation to more challenging applications around obstacles and making sprayer adjustments. This tool is just one piece of the applicator certificate at Highland. Students will take courses on crop science, soil science, pest identification, and chemicals along with training on the simulator. After completion of some coursework and simulation training, students will apply for internships with local businesses to work on putting their skills to use. Jay Kempel, general manager of Stephenson Service Company, said the agricultural spraying simulator allows each participant the opportunity to engage in a high tech, real-life spraying experiences. It gives students a chance to learn what it is like to operate modern spraying equipment. The simulator has all the controls, seating and steering found in the cab of an actual machine. While at the controls, the student is surrounded by large screens that project a real-life spraying experience. “I think it is a great asset for the Highland College Ag Department to have a High-Tech spraying simulator. This type of training is what will make Highland’s graduating students very attractive to local Agri-Business Companies for a career in Custom Application,” said Kempel. For more information on Highland’s Ag Program visit highland.edu. 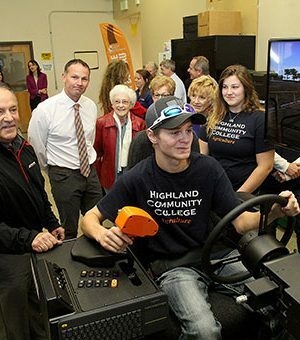 Photo Caption: Jay Kempel, left, of Stephenson Service Company watches Lucas Boomgarden, center, of Orangeville navigate the agriculture simulator.